Sand lightly with #100 paper to open the pores. By brush or roller apply as much TEAK OLJE as the wood will absorb. 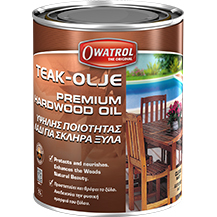 Apply one coat of TEAK OLJE only to the areas which appear weathered. Do not allow TEAK OLJE to dry on metal or fiberglass. Dry TEAK OLJE can be removed from fiberglass with a paint remover made for fiberglass. Ask your dealer for more information on TEAK OLJE or write to the address at the bottom of this can. Setting up time before use : 2 days.